In our home, breakfast time is often pretty rushed. We try to stick to healthy meals, but we're totally guilty of grabbing something not so nutritious and running out the door. I'm sure we're not alone in this one! We've been looking for better grab-n-go breakfast items to replace the toaster pastries and breakfast bars, but honestly, it's been hard to find fast, quality stuff that isn't packed with sugar. 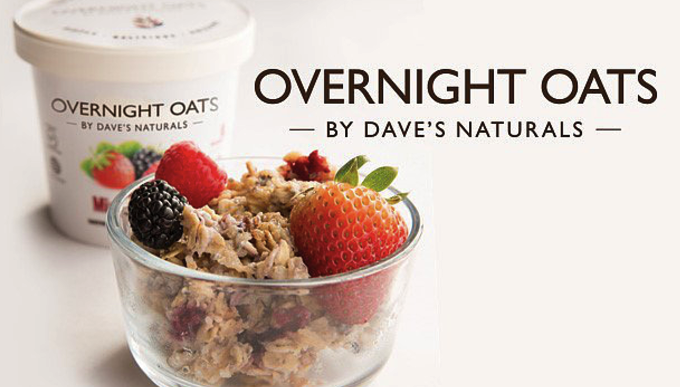 When Dave's Naturals asked if we'd like to try their new gluten-free, organic Overnight Oats, we were really excited because it seemed like exactly the kind of replacement we've been looking for. 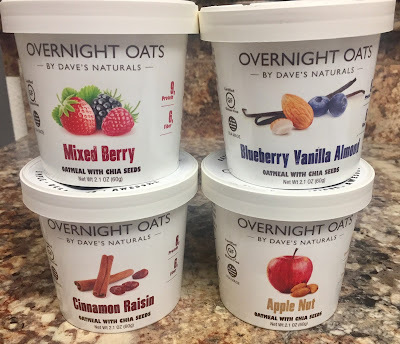 The Overnight Oats come in 2.1 ounce cups, with four different flavor options: Blueberry Vanilla Almond, Apple Nut, Cinnamon Raisin, Mixed Berry. Our family enjoys all four flavors, with Apple Nut being a top choice. If you haven't tried them yet, we highly recommend them! Dave's Naturals Overnight Oats are a blend of organic oats, chia seeds, almonds and fruit. The preparation couldn't be simpler. Just peel back the seal, pour in just enough milk to cover the oats, place them in the refrigerator overnight, and they are ready to grab and go in the morning. No cooking required! Peel, Add Milk, Refrigerate, and Enjoy! Not only are these Overnight Oats easy to prepare and a fantastic option for a quick morning breakfast, they are exceptionally flavorful. As someone who has grown up on instant oatmeal packets, I will say, the fruit never really tasted like fruit. I'm not sure how they did it, but in the Overnight Oats, particularly the Apple Nut flavor, the fruit has a fresh flavor and texture that is really delicious. It's definitely a hearty choice for the morning and prevents that morning sugar crash that other prepackaged, sugar-filled breakfast-on-the-go options offer. These are perfect for mornings when you're running short on time, but we like them so much that we choose them even when we've got plenty of time to spare. Beginning this month, you can purchase Overnight Oats on Amazon. You can also use the store finder page to find Dave's Gourmet products at a local retailer near you. 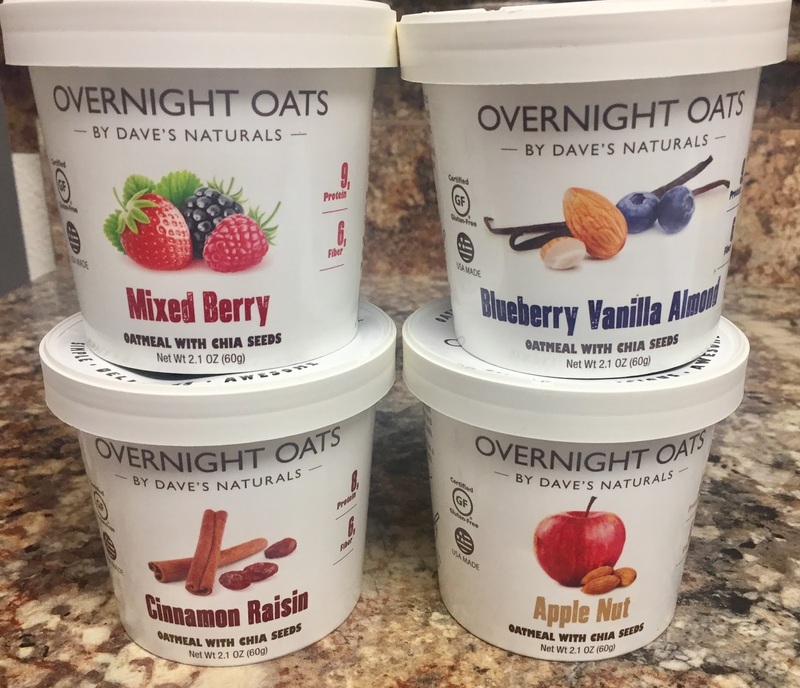 Dave's Gourmet has generously offered to giveaway a prize package of 8 Overnight Oats cups to one lucky Across the Avenue reader! Enter below for you chance to win. Entrants must be 18 years of age or older and reside in the continental US. P.O. Boxes are not accepted for shipment. The winner will have 48 hours to accept their prize and provide a valid shipping address. Across the Avenue is not responsible for prize fulfillment. Check out the full line of Dave's Gourmet products and connect with Dave's Gourmet on FB, Twitter, Instagram and Pinterest! Disclaimer: The products in the post were provided by Dave's Naturals. As always, our posts are our own, honest opinions.